Family Sleuther: Who Needs A Fancy Wedding? Who Needs A Fancy Wedding? My family seems to be quite practical when it comes to the business of marriage. When you examine my family's history of weddings, my parents’ marriage was an anomaly. They were married in a chapel. Okay, yes, it’s true that they eloped to Vegas and were married in the famed Little White Chapel (the same chapel that hosted weddings for Frank Sinatra, Judy Garland, and even Britney Spears). But the Vegas elopement wasn't why the wedding was unusual. The wedding was unique because they were married in a chapel – a non-traditional location for my ancestors. 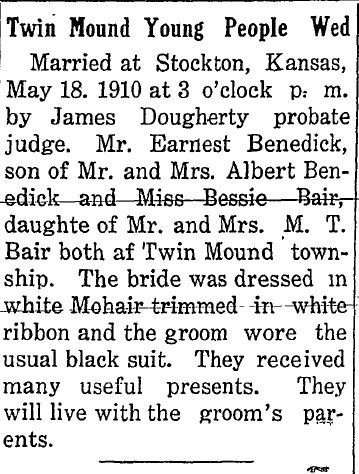 Both sets of my grandparents were married at a courthouse. In fact, three generations of my maternal ancestors married in a Kansas prairie town’s stone courthouse. Three generations of maternal ancestors married at the Stockton, Kansas courthouse. In an oral history interview, my maternal grandmother explained, "I never had a church ceremony. My mother and dad didn't have one, and her parents didn't have one. People just got married at the courthouse." Rooks County Courthouse in Stockton, Kansas. I suppose we’re not marriage-in-church people. Not because my family was irreligious and didn’t attend church. They were quite faithful and did attend services. My grandmother suspected the reason was economical. She remembered that earlier generations like her "mother and daddy didn't. My aunts and uncles didn't. Nobody did. Nobody had the money. Church weddings were expensive. People had big families. It was just the younger kids, the stragglers as they came along...and then they had church weddings because they were the tail end of big families." 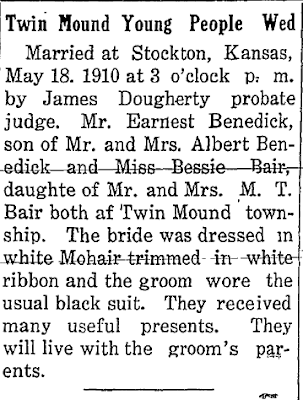 Consider the marriage of my second great-grandparents Ernest and Bessie (Bair) Benedick (pictured above at far right) who received "many useful presents" and lived "with the groom's parents." In reading these clues in the wedding announcement, it seems money may have played a role in their decision to marry at the courthouse and forgo a presumably costly church ceremony. There’s no expense involved in exchanging vows in front of a county judge. No fancy dress to buy. No army of guests to feed and entertain. It’s all quite practical, which must have appealed to farm families of modest means. And yet I wonder - had money not been an issue (if it really was the issue) - would my ancestors have wanted something a bit more lavish? Perhaps their modest lifestyle was so deeply ingrained in their being that it would have seemed a waste of hard-earned resources. I guess the Little White Chapel may not be for everyone.